ANAHEIM, CA - (June 16, 2015) - Increases to General Fund allocations and Capital Improvement Plan support emphasis on public safety, community outreach and encouraging business growth. The Anaheim City Council tonight unanimously approved a balanced budget for fiscal year 2015/16 reflecting a healthy economic outlook and strong fiscal standing that will benefit residents, businesses and visitors and maintain Anaheim as a vibrant place to live, work and play. The $1.7 billion budget provides $10 million in supplemental funding and supports 10 new police officers, new or improved parks and community centers and street improvements while maintaining Anaheim’s reserve balance. The 2015/16 budget enhances Anaheim’s already strong financial standing, reflected in AA ratings on the City's general obligation bonds from Moody’s, Standard & Poor’s and Fitch Ratings. The Capital Improvement Plan included in the 2015/16 budget will invest $300 million in our community on parks, community centers and continuing street and transportation improvements. The budget document can be accessed online by clicking here. Below are highlights showcasing the City’s commitment and dedication to the community. Anaheim’s commitment to public safety continues with enhanced resource allocations to Anaheim Police Department and Anaheim Fire & Rescue. Anaheim Police is in its second year of a commitment to hire 40 officers in four years and will bring on 10 new officers in 2015/16. In addition, Anaheim Police continues to see tremendous results from its youth outreach programs. Participation in the Anaheim Police Explorers, Junior Cadets and Public Safety Career Pipeline programs are encouraging Anaheim’s young residents to stay in school, set and achieve goals and contribute to their families, neighborhoods and community. Anaheim Fire & Rescue continues to be a leader in service, education and outreach. For fiscal year 2015/16, the Home Safety Visit program will continue to educate residents so accidents and tragedies are greatly minimized. Anaheim Fire & Rescue will also enhance service by relocating one existing station and add a new station, both to improve response to critical needs. Improving quality of life is a priority for the City of Anaheim. The 2015/16 budget addresses Community Infrastructure by enriching public facilities such as parks, libraries and community centers, as well as maintaining and adding elements so Anaheim remains a beautiful place to live, work and play. Exciting new neighborhood projects are scheduled to begin construction and open during the coming fiscal year. Those include Ponderosa Park’s new gymnasium, playground, water feature and skate park; a walking path and additional lighting at Edison Park; and improvements to Little People’s Park, among other projects. The City’s Fun on Wheels mobile recreation program will continue to travel to 10 different neighborhoods on a weekly basis giving children the opportunity to receive after-school homework assistance, exercise activities and arts and crafts. Anaheim’s General Fund budget is in large part supported by the City’s recognition as an international tourism, sports and entertainment destination. The Anaheim Resort provides approximately 50% of the General Fund revenues that support core city services. Building on the important role tourism, sports and entertainment plays in the quality of life for all Anaheim residents, the City has embarked on the seventh expansion of the Anaheim Convention Center. An additional 200,000 square feet of flexible space will allow for concurrent events and the hosting of new meetings groups. The LEED-certified Anaheim Convention Center is the largest on the West Coast and will continue to play an important part in Anaheim’s future. Other business growth opportunities in place and to be implemented include an Automobile Dealership Economic Assistance Program, a Hotel Incentive Program and further reduction of red tape to make Anaheim even more business-friendly. City leaders continue to look ahead for opportunities to better the community. 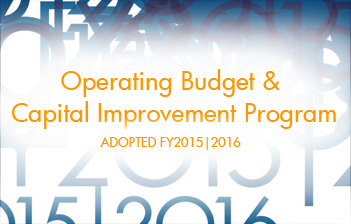 For the next five years, the City has identified several capital improvement projects reflected in the fiscal year 2015/16 budget. In December 2014, the City of Anaheim opened the Anaheim Regional Transportation Intermodal Center. Known as ARTIC, the world-class facility accommodates 10 modes of transportation, including rail, public and charter bus services, taxi service, carpooling and bicycling. With an iconic design, ARTIC will offer enhanced dining starting this summer and is surrounded by world-famous entertainment venues and attractions. In ARTIC’s initial stage of operations, the City is working to establish the transportation hub as a self-sustaining asset for the Orange County’s long-term transit needs. For fiscal year 2015/16, ARTIC will require $2.2 million to supplement operating costs. On June 15, 2015, the transportation committee of the Anaheim Tourism Improvement District voted to allocate $4 million to supplement operational funding of ARTIC, including $1.9 million for fiscal year 2015/16. Additionally, the City continues to look at ways to enhance revenue and minimize operating costs during ARTIC’s start-up phase. In 2015/16, ARTIC also will draw on $300,000 in funding from Measure M, the countywide, voter-approved transportation tax. Anaheim’s commitment to fiscal responsibility has allowed the City to emerge from the recent economic downturn in a position of strength. As the local, state and national economies continue to improve, Anaheim is poised to grow and enhance services for the benefit our local community.